After more than two centuries of distorted or incomplete text when tackling aspects of the French 1798-1800 period, one has to accept that few contributors bother to bring forward all relevant facts. As long as the national story feeds on anti-Bonapartist, meaning anti-secularisation, fragments from the past, any version will do. Document signed by Bonaparte in 1798 conceding St John’s in Valletta to the exclusive use of the Catholic Church. The article entitled ‘Archbishop laments destruction of heritage’ (February 8) appears to be the most recent case in point. Boosted with a colour picture of church silverware, the unsigned report states inter alia that “the French cleared several churches of their silverware to mint coins”. Unfortunately, no information on a book referred to in this report was given. Readers of this paper might be interested to recall that according to the convention between Bonaparte and the Order on June 12 1798, property and possessions that had belonged to the Knights were passed (with four Maltese leaders’ approving signatures) to the French Republic, including St John’s, in Valletta. When, on June 10, Bonaparte visited the Mdina cathedral, he assured Bishop Vincenzo Labini that the French did not want to take anything that belonged to the Maltese Church. The archives confirm this by an agreement, entered into on July 5 between the Catholic Church and the republican government, regarding compensation which the Church bound itself to give in return for the acquisition of its exclusive use of St John’s. The arrangement was legally binding. It was verified by witnesses in front of Notary Francesco Cremona on September 16, 1800, that is, 10 days after the French capitulation. Church silverware thus conceded to the government was meticulously recorded by mint director Joachim Lebrun. It totalled 489,659 Maltese scudi, equivalent to circa €49,000. Until this day, St John’s, solely used by the Catholic Church as its co-cathedral, is owned by the State. 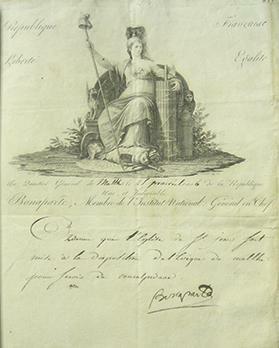 Pity that its museum has never exhibited a historical June 13 document featuring Bonaparte’s signature on this unique article still archived at the Curia, in Floriana. As it turned out, the legal deeds were certainly instrumental in resisting attempts by the Anglican Church to take possession of St John’s for its own use soon after Malta became a British colony.